When I came across Rona Renner’s Is That Me Yelling? I knew I had to see if what she had to say would be valuable to me personally. You see, I am a mom who chooses to work because I feel it allows me to have a better relationship with my kids. And still, even though I am not cooped up with them all day every day, I am a mom who yells way more than I want to. When it comes to parenting books, some people look for an overall philosophy to follow. Other than refraining from screaming at your kids, this book doesn’t offer that type of overview nor the far reaching implications in any sort of depth. Instead, I am happy to report, we are given real, in the thick of it ideas to help improve the way we handle stress around our kids. If you are like me, always on the lookout for a book full of practical tips to deal with certain types of parenting scenarios, instead of just theoretical ideas, this book is for you. 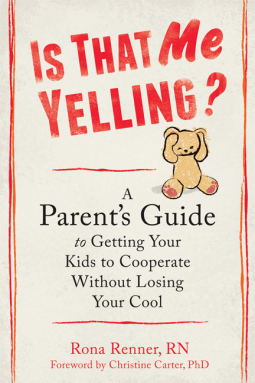 Renner offers explanations for strategies such as tracking your yelling to learn when you are most vulnerable to fly off the handle, and the A-B-C-D-Es of not yelling to equip you with a thought process that allows you to keep your cool. There are many valuable insights that I have been able to take away from this read. For example you will find a temperament inventory that has helped me to understand why I clash with one of my children more than the others, and why my two oldest spend so much time arguing. Not only have I been able to see the dynamics on an objective level, but the author offers her advice on how to shift expectations of behaviour and outcomes depending on the temperament traits innate to our little ones. Over the few days that I have been going through this book, I have found myself applying the principles I have learned as I live life. Particularly, as I feel my stress levels rise around the kidlets, I have been successfully employing what I have learned in order to remain (more) calm. Is That Me Yelling? will get in your head, and speak loudly and clearly as you go about your life in parent mode. What I have learned has allowed me to step back and think before my mouth starts moving. And when I am able to change the way I would normally do things, on the fly and in real life, I think that’s when I can confidently recommend this as a helpful parenting tool that is definitely worthy of your time. And any time I need a reminder of how to avoid raising my voice, I will come back and read through Ms. Renner’s book again. This entry was posted in Muse Reviews and tagged book recommendations, Book Reviews, Parenting, Rona Renner, Strategy, Yelling. Bookmark the permalink. Pingback: Review: Is That Me Yelling? : A Parent’s Guide to Getting Your Kids to Cooperate Without Losing Your Cool | The Avid Reader – Books, Books, Books! Will definitely have to pick this up.